One of a number of Gloria’s composed by the Venetian maestro, this setting is known simply as the Vivaldi Gloria due to its outstanding popularity. It has featured in a number of films including the 1996 Scott Hicks film Shine about pianist David Helfgott and in the final climactic scenes of the 1985 Andrei Konchalovsky film Runaway Train. Under the baton of Norman Duffy and accompanied by Ronan de Burca, Galway Choral Association will also perform a selection of well known works by Dowland, Gounod, Lennon & McCartney. The choir will be joined by Coláiste Éinde Show Choir, directed by Anne Marie Taylor for what promises to be a most enjoyable evening of sacred and choral music. 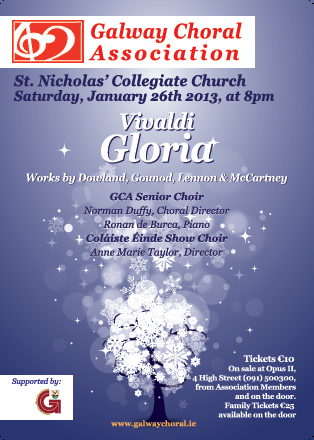 Speaking this week, Galway Choral Association Chairman Michael O’Hare said that the choir were looking forward to their first concert of 2013. Tickets costing €10 are available from Opus 2, High St Galway 091 500300 or by contacting admin@galwaychoral.ie. Family tickets for €25 will be available at the door.